I am so excited to for today's post! Last summer we had THE BEST time on our first real family vacation - a road trip to Colorado! We made it to Colorado and were READY to breathe in the mountain air. Summer in Texas can feel suffocating and we were so excited to get to experience some cooler temperatures! We stayed in Vail which was beautiful. Just walking around Vail Village and letting the kids play on the playgrounds (Starbucks venti in hand, duh!) was vacation enough. ... and indulged in some sweet treats. ... and Luke had the best day ever when we got to go into a REAL MINE and then pan for gold! ... and explored Lionshead one evening. My FAVORITE part of the whole trip was hanging out down by the river right outside of our condo. The boys loved throwing rocks and getting out into the river a bit to feel how cold the water was. It reminded me so much of all the evenings I spent throwing rocks at my grandparents cottage. Pure summer perfection. ... climbed and took in the amazing views. ... and then road tripped back home. The trip was fun-filled, but relaxing and the perfect mix of activities and exploring. ... including what we did, where we ate, where we stayed and what we loved. And if you have a question, leave it in the comments and I'll get back with you! I loved this vacation so much because it included all of our favorite people, but our best pre-kids vacation was a trip we took through the Canadian Rockies that you can read about HERE. Can you tell that we're cool weather vacation people? ;) Sweatshirt weather is perfect weather and we tend to seek that out when we can. 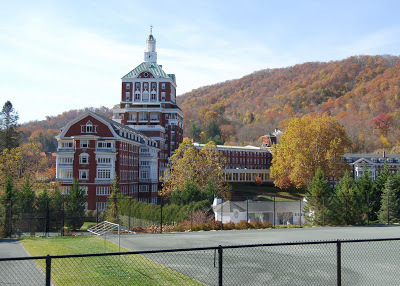 And since we're talking about cool weather vacations, our trip to The Homestead is worth mentioning as well. I was pregnant with Mason when we went and I still occasionally dream about the naps and bubble baths I enjoyed on that trip. Now it's your turn! Link up below and share your favorite vacation(s)! I can't wait to see all of your favorite spots! What a fun linkup! Vail is gorgeous. We love it there It looks like you had a blast! I loved all your Colorado pics so much we added it to our to-do list!! You had me at escaping the Texas heat! This is one of my favorite show and tells we do!! I've already gotten ideas for future family trips!! Cadillac Ranch looks so cool! My kids would LOVE seeing that! And I agree, sweatshirt weather is perfect weather! Seriously....can you believe how much GG has grown since your Colorado trip??!! I love this trip and remember following along last year. Looks so perfect. Vacationing in Colorado vicariously through you last summer was the best!;). I never really thought about it as a vacation destination for us but now I am! Also, this is random, but my husband and I were in the Canadian Rocky Mountains in August of 2006. 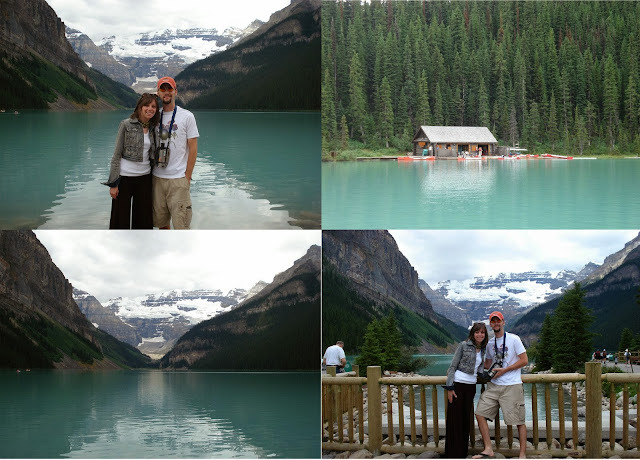 We flew into Calgary and stayed in Banff, Jasper and Lake Louise, loved it! We are totally leaving for our road trip to Colorado on Friday and I couldn't be MORE EXCITED. Except it will take us 28 hours to get there but we a) wanted to bring our dog and b) I've never road tripped like that before sooooo - LETS DO IT! T-minus 3 Days and 7 Hours till we hit the road!! So random, but someone else mentioned Cadillac Ranch just yesterday and wanting to go there. I've never heard of it before yesterday and now today. What a fantastic vacation. You guys are brave going that far driving with littles! I bow down to you! I can't wait for our few upcoming family vacations. We haven't done one in a while. Sweatshirt weather is my favorite weather too. Now I want to visit Colorado! Looks lie an amazing time! I'm a beach girl myself, but I LOVED following along on your CO road trip last year! Going to hopefully do one of our own next year (I need the beach too much this year to opt for Colorado!) Picture perfect vacay! Could you share some info on where you rented your condo from when you stayed there?